A little spot of winterliciousness from Austria, as photographed by 'Anuwintschalek' on Flickr. Perhaps her Triobike is parked nearby. 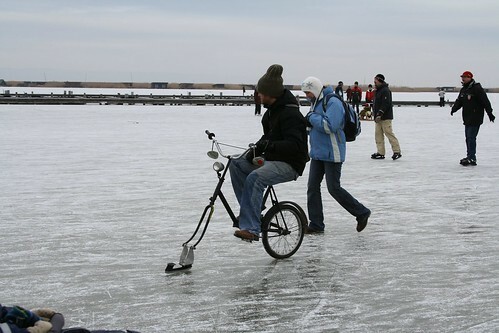 With the record cold snap chilling most of Europe, it's nice to see how cyclists across the Continent either just get on with it or find unique ways to adapt. Nice to see he is riding a normal bike and I love the mirrors. You never know who's skating up behind you.